When you live out in the boondocks, sometimes you have to get creative to make life interesting. At our house, we play a game called “Schmutzi, Scab or Mean Buggy” to enliven our days. I suspect some of you out there may also play a version of this game. The game begins when you send your hounds outside to play or potty in the back yard. The game is most exciting when it’s a nice day and the kids decide to hang out for a while or lay in the sun. The longer they are outside in the back yard, the more challenging the game. What is this faint discoloration, scab? The real fun begins when they come back inside. Depending on how sporting I’m feeling I may change up the rules a little during this part. Being the self-appointed game “commissioner” and the only player with opposable thumbs, I can make these rulings. If I’m not feeling sporting, I make the kids wait on the porch. I go outside and conduct my inspection. We check every body part both visually and with a pat down. 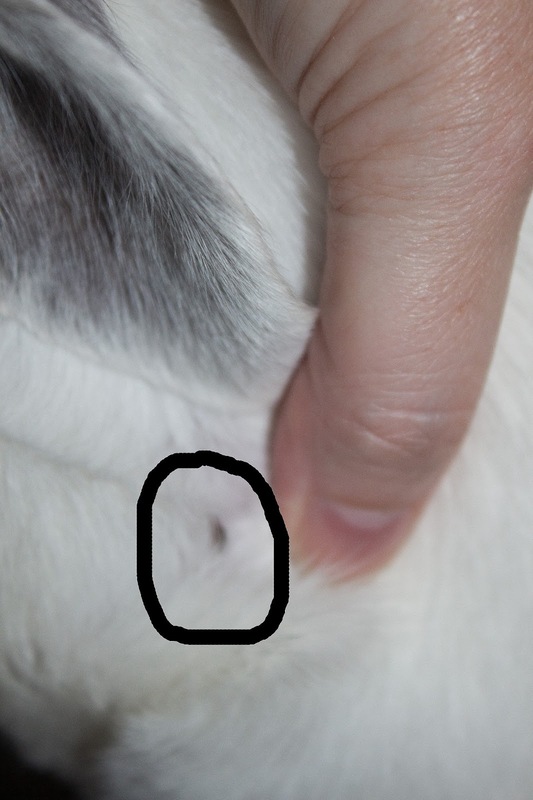 When I come across a dark patch or a lump or otherwise unidentified object on their bodies, I must pronounce what I believe this to be. Some schmutz they picked up, like dirt or grass etc. 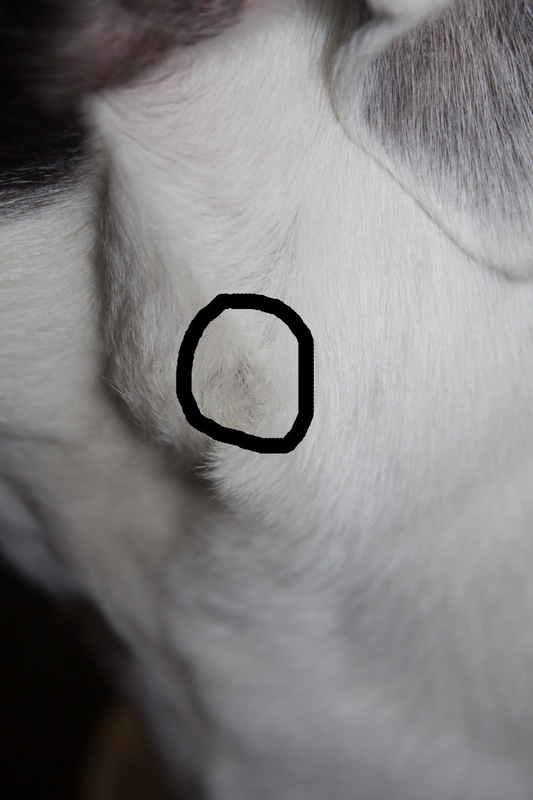 Or a scab that they picked up by running in to some object or each other. Or a mean buggy and by this we typically mean tick but sometimes mosquito. Then we do a closer inspection and find out if Mumma won the big prize. If I’m feeling sporting, I may let the kids come from the back yard directly into the house uninspected. Then we play the game in the kitchen or living room. This is more of a challenge because there is the added excitement of a mean buggy making an escape and taking up residence in our house. This year we have had a tick and a number of mosquitoes make a break for it. 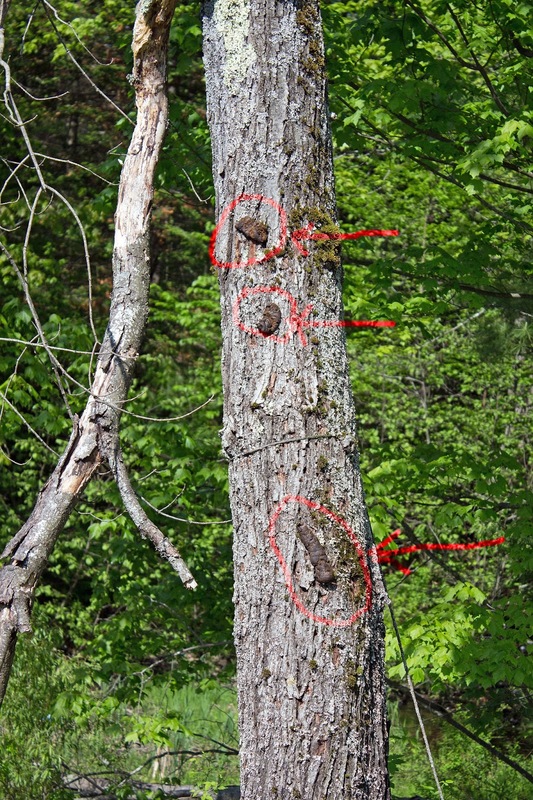 We never saw that tick again. 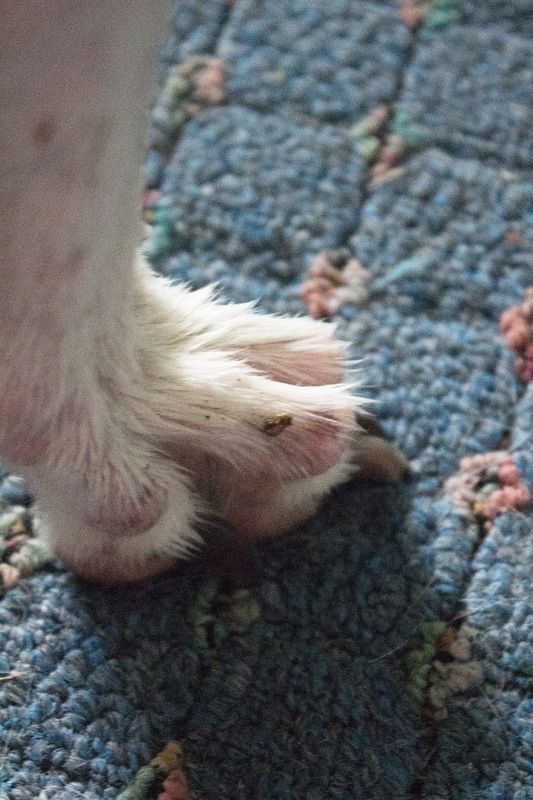 Sometimes, Mumma misses a lump or spot upon initial inspection. That’s when the game goes into extra innings. Usually I’ll be sitting on the couch snuggling with one or the other or both hounds. Then I find an unexplained bump. Inspection ensues and usually we’re on our way to the bathroom to give our tick friend an alcohol bath. Not long ago, I had to play the game at midnight when I was patting Bettina as we were headed off to sleep and found an unexplained bump on her hip bone. I didn’t win the prize on that one having guessed scab only to find out it was mean buggy. I’m glad we found him before we fell asleep but just try getting a good night’s sleep once you have lost a round of “Schmutzi, Scab or Mean Buggy” in your own bed. Anda One, Anda Two, Anda Three? 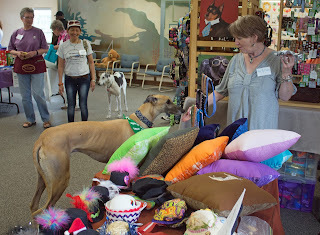 This past weekend the kids and I enjoyed ourselves at the Maine Greyhound Placement Service’s annual Open House. This year they are celebrating their 20th anniversary. 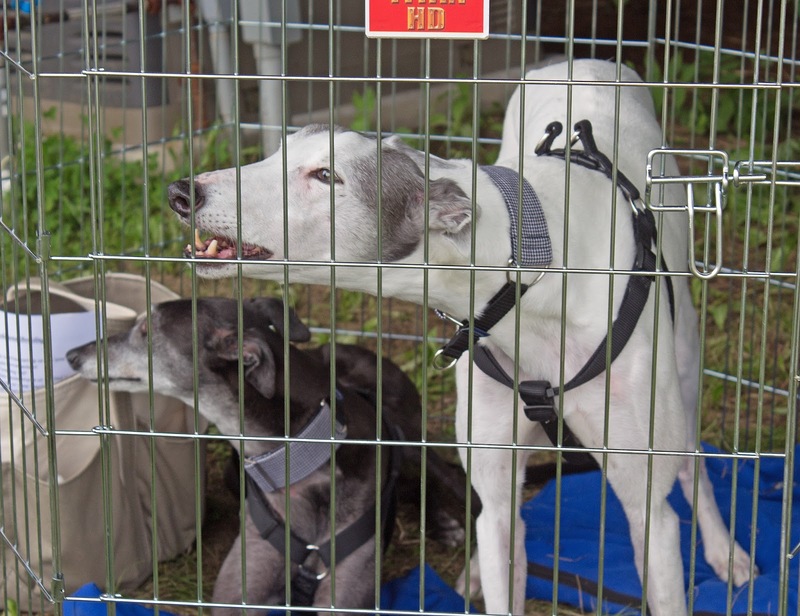 As we usually do, we spent a lot of money, brought home new collars, ate our fair share of grilled meat and we even won one of the raffle prizes. I happened to be speaking with Scott Bruns who founded MGPS. He has a wonderful grey named Cider. This handsome fawn boy is ginormous. He is almost as big as a Great Dane. And he is utterly bonded to Scott. If Scott leaves Cider’s sight for even 30 seconds, it is a huge party when Scott comes back. Cider celebrates as if Scott had been gone for years. When Cider arrived at MGPS, he was all the talk amongst volunteers. It was thus that he came to my attention. Carol, Blue and Bettina’s Auntie and our friend, volunteers at MGPS. From time to time she lets me know about special greys that arrive at the center. She knows my deep dark secret. That I long for a third greyhound. I’ve been thinking about what life might be like if we added a third greyhound to our family for years. There always seems to be a very good reason why I shouldn’t do it. At first my car was so tiny we could barely fit two greyhounds in the back. Then that car caught on fire and we got a great new greyhound mobile (Honda Element, best dog car ever). Plenty of room for a third and possibly even a fourth greyhound in there. ﻿﻿ Then Girly Girl got ill and our savings was wiped out. Money was tight. The price of everything was going up but due to the economy, no ones wages were. Lately those worries have eased a bit and I’ve actually started to rebuild some savings even though we’re a long way from recovering from Girly Girl’s medical bills. I still live in fear that Blue or Bettina gets that diagnosis. Still Cider was pretty special so Carol told me about him. I obsessed over Mr. Cider for a number of weeks. I had, against all good sense decided to call and make an appointment to see him. The next day I found out that Scott had adopted him. Cider is so clearly happy in his life with Scott; it’s hard to be sad about that missed opportunity. I shared that story with Scott and he asked if I had been thinking about adding a third greyhound. He told me about a sweet female who was currently onsite but not in the general adoption population currently. 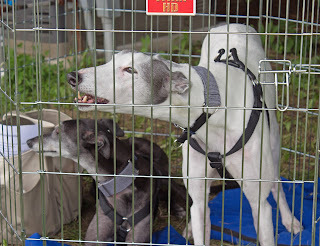 She was earmarked to go to someone who already owned or had owned greyhounds. My stomach knotted up. ﻿﻿﻿ My heart wanted a third hound. I always thought it would be another big dopey boy but a loving little female would be good to. There were still some obstacles but this was probably the best time there ever had been for adding a third baby. I asked Scott if I could see her when he had a moment. Not long after that, he was placing a leash in my hand and I was walking this little peanut. She was just out of the kennel so she was wound up a bit. And she was overwhelmed by all the people, noise and commotion of the Open House. I took her for a little walk outside and away from the crowd. She wanted to check everything out. But for a few moments she’d come and bury her head into my chest for a snuggle. Or she’d lean against me when something frightened her. We walked over to the ex-pen under the shade of the trees to say hi to Blue and Bettina. 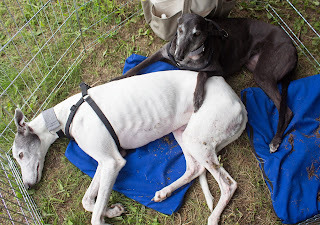 Oddly, neither Blue, nor Bettina got up from their prone position to greet a new greyhound. They lay there looking at me and then at her. No wagging tails, no baring of teeth, no reaction what-so-ever. two are good for the time being. I walked her around a little more. I asked her again. I got the same reply. With a heavy heart I brought her back to Scott. Now did I really get a message from this greyhound? I don’t discount the possibility. 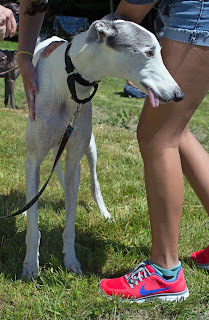 But it also may have been a message from my brain speaking to me in the guise of a little greyhound. Or perhaps they were both speaking to me. The end result was the same. We enjoyed the Open House. We won a new dog bed! My heart still has its little secret wish. Given how special the little female grey was, I have no doubt she will shortly find a great home with people who know and love greyhounds already. And someday, maybe someday, Carol will let me know about a great new arrival at the kennel who will tell me just as clearly that I AM his (her?) person.